Don't Forget The Grooms Cake! Let us match the cake with the groom and create a unique cake that he will remember forever. A cake for grooms will add that special touch and can make that someone special feel like someone special. The cake and the care in which it was carefully matched to their personality will surprise most grooms. This groom's cake was made for the dinner rehearsal for the wedding of Brittany and Clay Torrence. His big day is tomorrow (their wedding) which is the theme for the video! 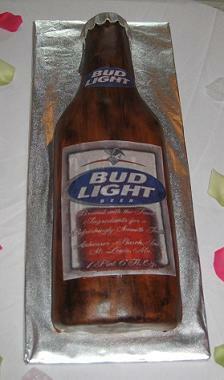 See our beer birthday cakes here! 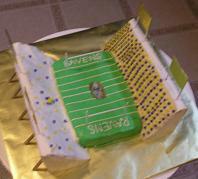 This Baltimore Ravens football stadium cake was also a groom’s cake made special and unique for Bryan. This grooms cake was made for John F. of Wake forest. The NC State cake flavor was vanilla with coconut butter cream covered with butter cream icing. 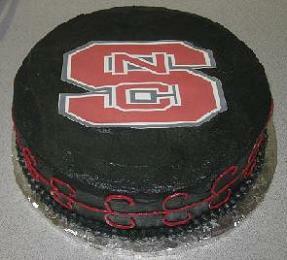 The NC State logo was printed on edible frosting paper. 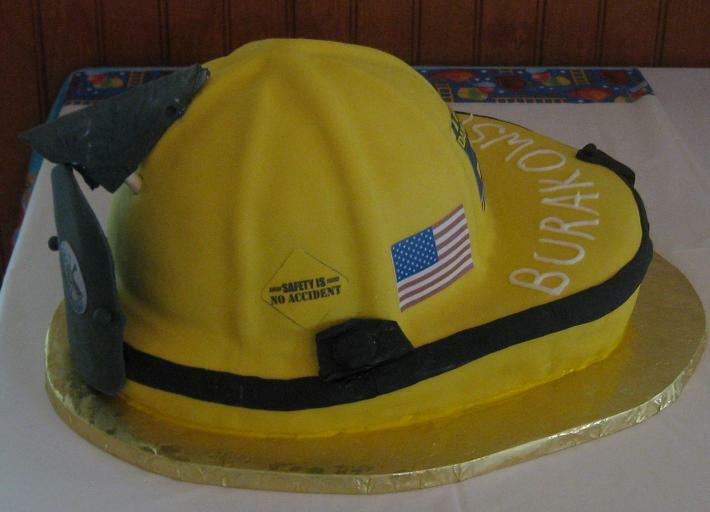 This fireman cake was made for the special groom/fireman. Decorated using hand made marshmallow fondant it was all edible. Velvet (the bride) ordered this grooms cake as a surprise for Justin (the groom). 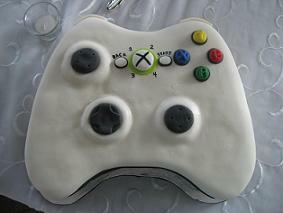 Representing his old favorite pastime was his xbox cake. His xbox groom’s cake was lemon flavor with a lemon mousse filling. It was covered and decorated with hand made marshmallow fondant and had a working (moving) joystick! See their awsome 4 tier whimsical wedding cake here! This brownie cake was a surprise for the groom. 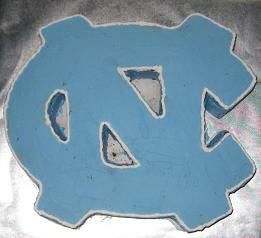 The brownie cake was filled and covered with whipped cream icing and carved in the shape of the UNC school logo. 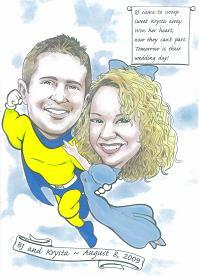 Pat from Raleigh, NC gave us this cartoon superman drawing of her son and his bride to be. We printed it on edible paper (frosting sheets) with edible ink. The groom's cake flavor was chocolate with buttercream icing. E-Mail Steph about your grooms cake here. Angela S. from Garner ordered this surprise grooms gun cake for her fiancée. 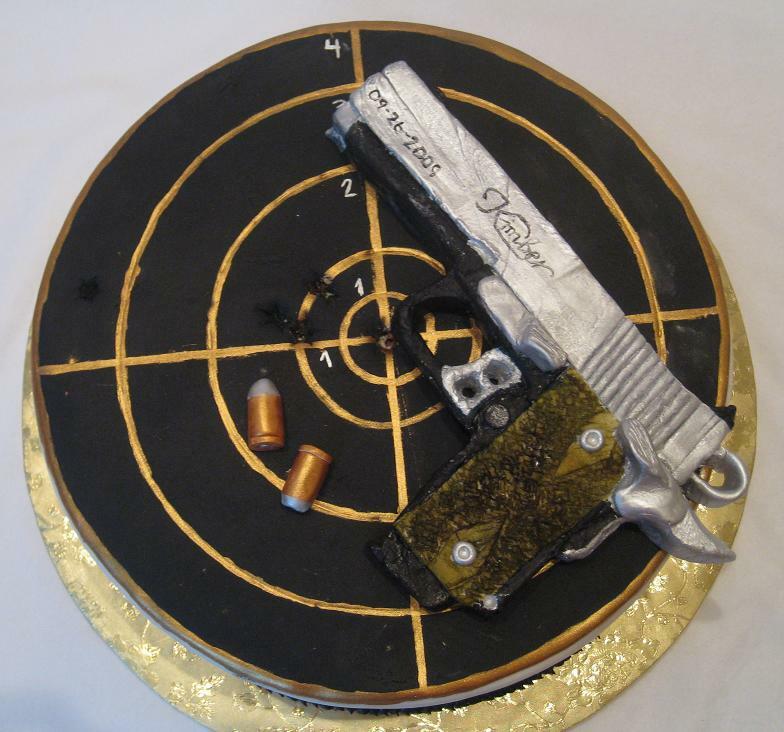 His favorite toy is a Kimber Stainless Gold Match II, so we replicated it from her picture for his special grooms cake! The gun cakes flavor was red velvet with cream cheese icing covered with our hand made marshmallow fondant. The target, gun, and bullets were hand painted using edible luster dust. 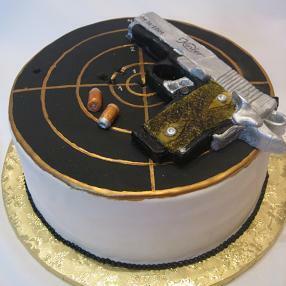 The Kimber gun and bullets were carved and molded from a mix of gum paste and fondant. I have heard of a shotgun wedding, but this one takes the cake! Everything was edible, even the bullets! 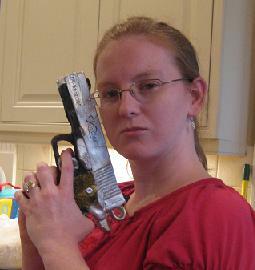 Just had to put Steph (Piece-A-Cake's Angel) with her kimber firearms. 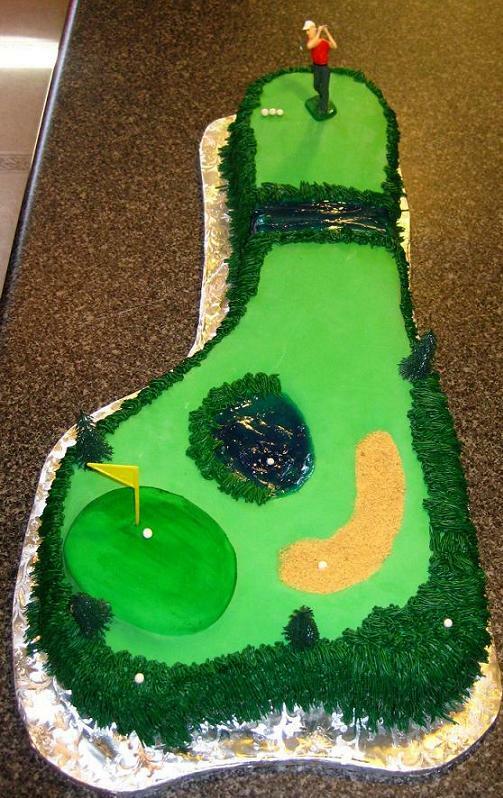 Go ahead, make my cake! 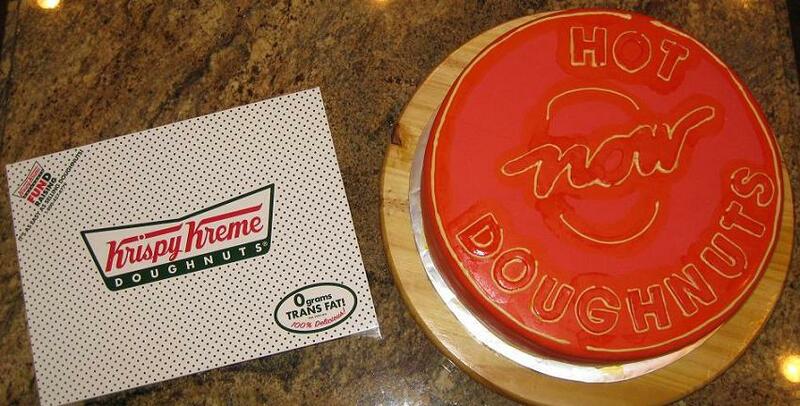 Nancy T. of Raleigh ordered this Krispy Kreme cake for her son. His favorite thing is Krispy Kreme Doughnuts and the bride and groom share and inside joke about the HOT sign! Doughno? 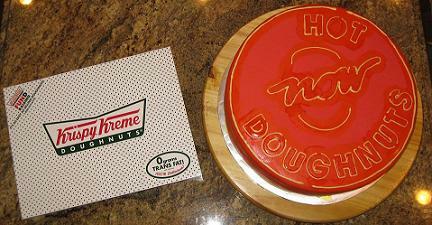 The Krispy Kreme grooms cake flavor was lemon with real lemon filling from the Krispy Kreme store, thanks guys! 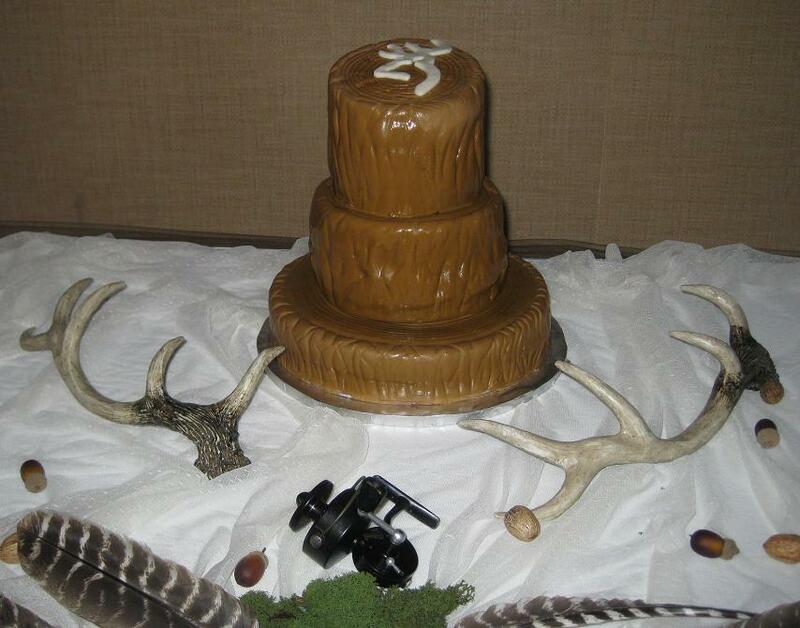 Christy ordered this custom hunting cake for her fiancé’s groom’s cake. The hunting cake flavor was lemon with butter cream and red velvet with cream cheese. 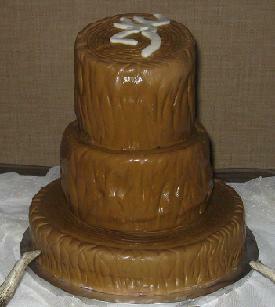 The cut tree design was covered in marshmallow fondant topped with a fondant browning dear head symbol. 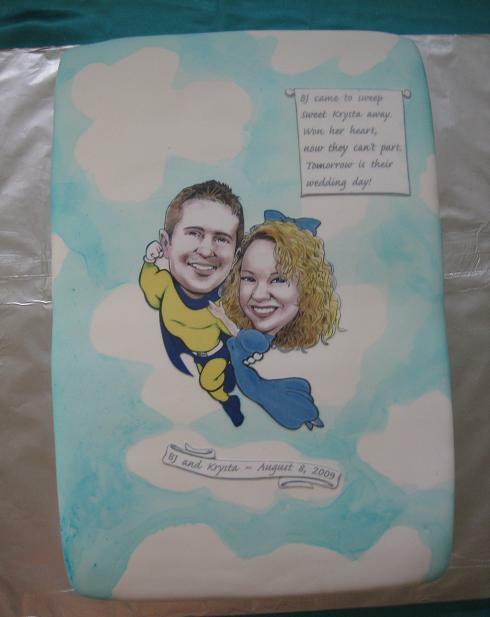 Match your grooms cake to the personality of the groom and he will remember it forever! 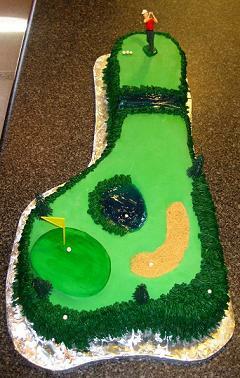 Nancy from Raleigh ordered this bass cake. This grooms cake was flavored white with butter cream and strawberry preserves for fillings. The cake was covered and decorated using our delicious hand made marshmallow fondant. The fish bait was a gummy worm! See more beer cakes here!